Do you know what that is? That my friends is a grease stoppage in a p-trap. 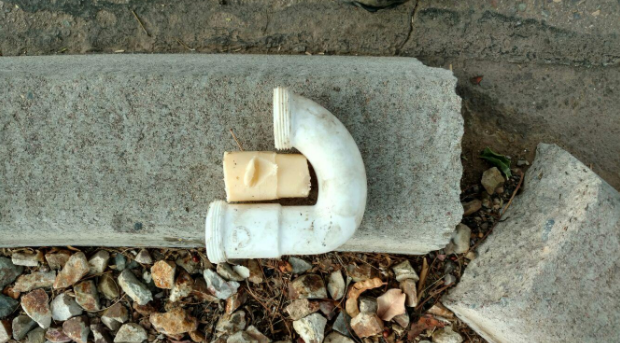 Friends don’t let friends put grease down their drain line. Almost daily we clear a grease stoppage for clients and I am here to educate you that grease and plumbing don’t mix. Grease will always win. There seems to be a rumor spreading that you can stick grease down your line if you run hot water with it….FALSE! Running hot water behind grease only sends it further down your pipe extending the stoppage even further, slowly coating your pipe over time with layers and layers of hot grease that cooled and coated the sides of your pipe. This photo is the cleanest, internet friendly photo we could come up with to demonstrate the power of grease and its ability to completely plug your drain line. Share this message with a friend, share it on social media, save the world from grease stoppages! Grease stoppages can’t be cleared permanently with a standard cable and drain machine, very much like sticking a knife into a tub of peanut butter, when you pull the knife out, eventually the hole closes and completely disappears. The only way to clear a grease stoppage is to use high pressure water from our specialized jetting equipment. The high pressure water cleans off the interior of your plumbing drain lines and leaves them squeaky clean, eliminating future grease stoppages as long as you stop putting grease down your line. Your kitchen sink isn’t the only place that grease can be found, your bathroom sink is also a place we find grease stoppages, as well as your bathtub. Surprised? Grease is grease, even if it is oil. Coconut oil has gained in popularity in the bathrooms of America, from oil pulling, to conditioner that coconut oil, while great for your body is not great for your plumbing. Check out more about coconut oil on our blog. Once you’ve had your drain lines jetted it is important to keep them clean and grease free. We’ve written an article on the things not to put down your disposal, grease included, check it out – learn what is not safe to put down your disposal.